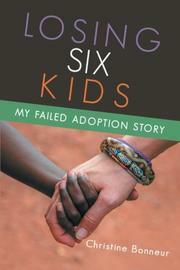 The author recounts navigating corruption in Uganda, where she attempted to adopt children. In the early pages of Bonneur’s debut memoir, a heartbreaking statement is made by the author: “I lost six kids in the span of eighteen months. And they were never really mine.” By her own admission, Bonneur, a devout Christian married to a Marine veteran, was drawn to the idea of the adventure of an international adoption, and she gave little thought to the possibility of exploitation within the industry. She was introduced to James and Kira, supposedly put up for adoption because of a “tribal taboo.” It quickly became clear James didn’t understand what was happening, and his mother didn’t wish to part with her children, despite the work of the overzealous ministry. The second introduction was to Benjamin and Anna, two children who bullied each other constantly and regularly attempted to escape. They had been stolen by a pastor looking to sell children to support his church. She met Paul and Sasha, the latter prone to constant tantrums. She discovered much of Sasha’s distress was egged on by Paul, who, it turned out, was a young con coached by his mother. Crestfallen, the author returned home in 2015, eyes wide open about the system and with a deep desire to share her adventure-turned–cautionary tale with others hoping to adopt abroad. Bonneur gives a warts-and-all view, from detailing the extensive bureaucracy and money involved to her attempts to reunite the exploited children with their families to her profound personal challenges. Her memoir includes shared correspondence, personal journal entries, Scripture, and black-and-white photos. Crushing as all this is, the book also celebrates Uganda’s people, wildlife, and culture. An honest, heart-rending account of yet another aspect of human trafficking.